Recently, I spent some time at Maui in the midst of an East Coast snow storm. 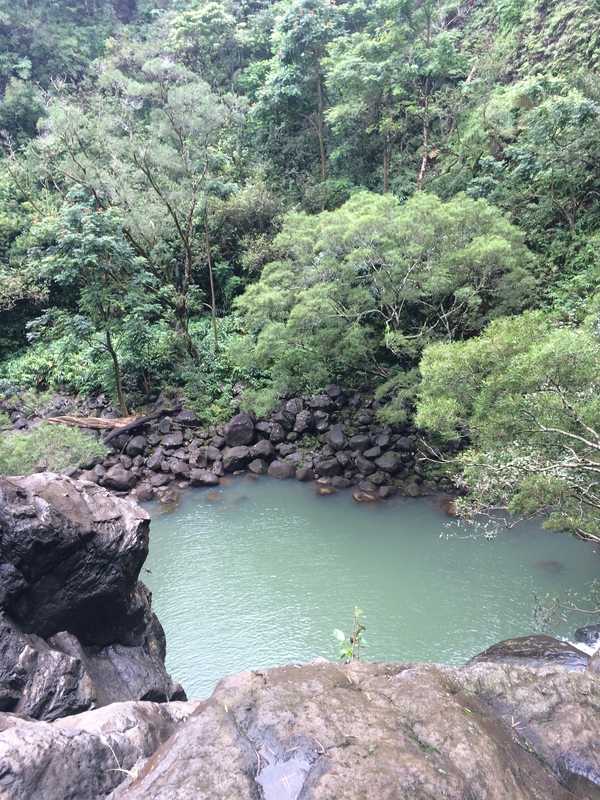 I traveled to Maui, and up the Hana Highway to check out the botanic garden. 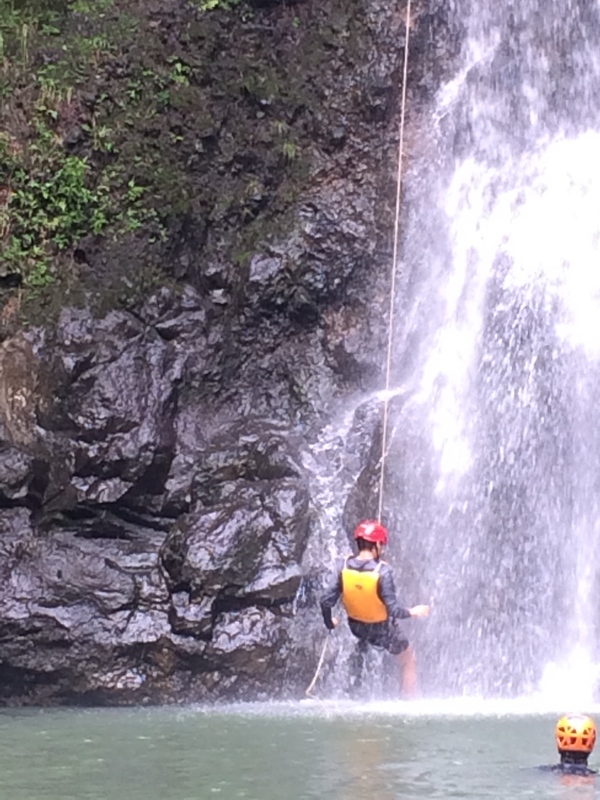 It was part of a Canyoneering Adventure Tour, and I tried out rappelling down the Maui Waterfalls along with the rest of my group. I’ve never tried rappelling. I was completely unaware of what it was before this trip. Essentially, you attach yourself to a harness and keep in contact with the nearby rocks to explore canyons and waterfalls. Pro (rappelers?) will travel down miles of canyons/falls, but for this tour I explored 50-60ft waterfalls. At first, I struggled with the whole concept of the sport. Our guide taught us the fundamentals, and he told our group to lean back against the rope letting go of your hands. 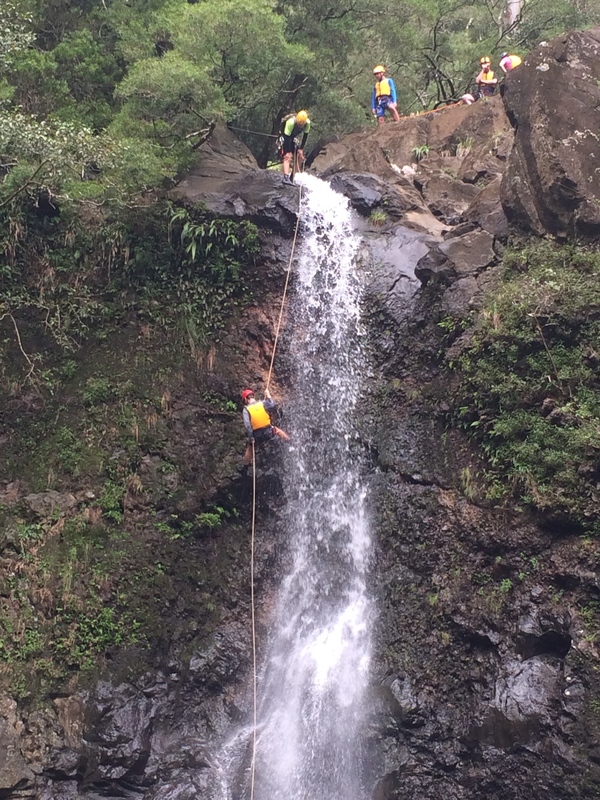 When you rappel, you’re expected to hang off of a waterfall with no hands. It feels like you’re about to free fall at any moment. The guide is there to make sure you walk down the waterfall correctly. It’s important that you don’t hesitate when moving, but you have to be self aware. The water flow will rush right past you, and you’ll be expected to place your foot on the right ledge so you can move. 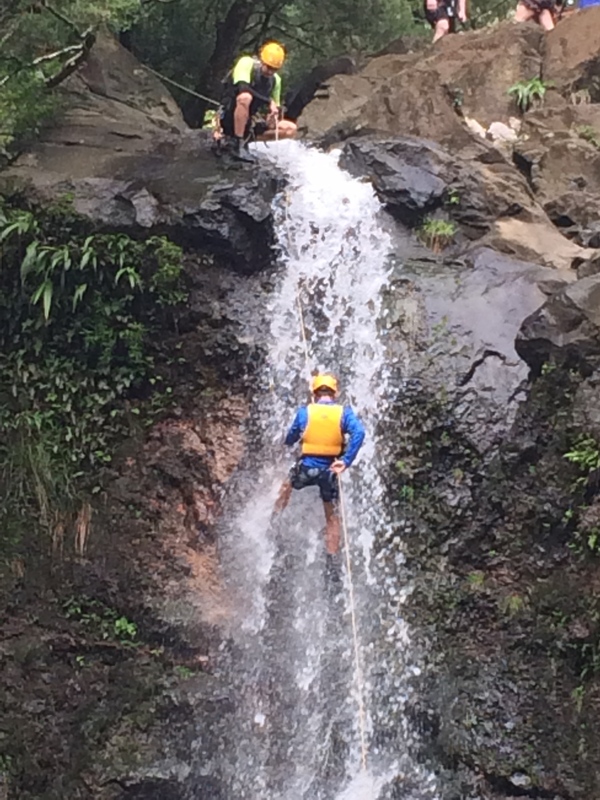 When you decide to repel down a waterfall make sure you commit to it. You don’t want to be in the middle of the waterfall, decide you want to leave, and have someone go through the trouble of lifting you up. For a beginners tour, this is fine because you’re learning. The tour guides are responsible for your safety, and they’ll help you when you need it. Imagine what it’s like when someone’s not there to hold your hand. It’s obvious you need to commit to that goal yourself. The guy is a professional and is paid to keep me safe, but I didn’t trust him. Not a good move. You control how fast and smooth you move down the waterfall. If you don’t allow your hand to stay free you’ll just move in a choppy movement. Then when you suddenly get that feeling of freedom, you’ll freak out because you’re not used to it. You’re not used to the fluid motion, and then what most beginners will do (like me) is panic and hold on tight to the rope. That’ll burn you and it’s not fun. 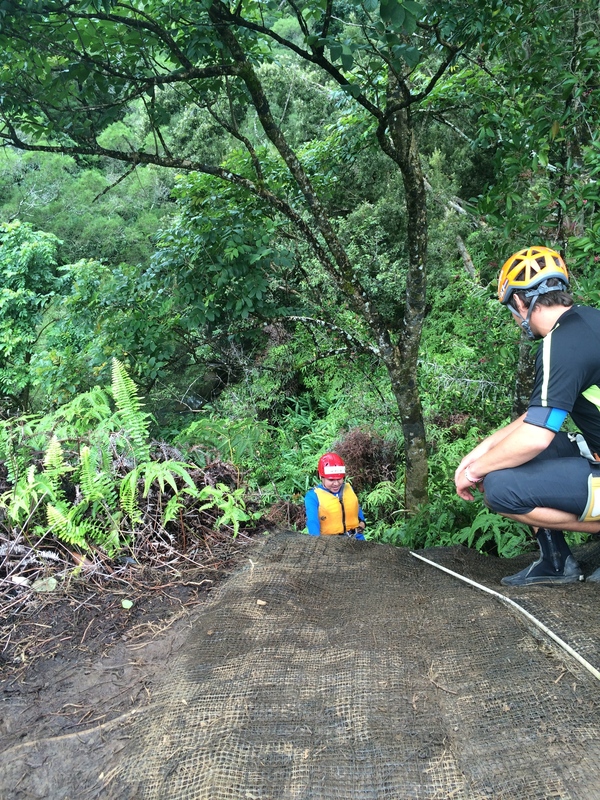 I watched how other people (even my little brother) hiked down the mountain after several trials of rope burn. They didn’t hesitate and moved with ease; they successfully climbed down a 60ft waterfall (and even scored a few style points with their picture poses). Naturally, I wanted to get my own picture for Instagram; the next waterfall we went to I let go of the rope more. That’s when the fun began. I moved with ease and didn’t even think about heading back. I smoothly landed in the pool at the end of the fall, and it’s because I stay committed. This is good because you’ll learn and experience more. Stay committed and what you thought was hard will become easy. If you let fear paralyze you, you won’t be able to fully experience life at its fullest. I couldn’t let fear stop me right in the middle of the waterfall. You won’t go anywhere or do anything if you don’t take action! If you’re scared to do something, chances are you should go ahead and commit to it. You might realize how fun something was, or see for yourself what you were missing out on. I’m going to repeat this again. You NEED to commit! Move forward to your actions and give a 125% effort. Most people will settle just for the required work, or they might even give only 70%. Make things easier for yourself; give 125% effort to go ahead and MAKE SURE you give it your all. Indecision stems from procrastination. If one is found the other is sure to be right around the corner. You can’t start on a project or move down a waterfall if you can’t decide how to take the first step. Kick these dream-killing habits to the curb and commit.